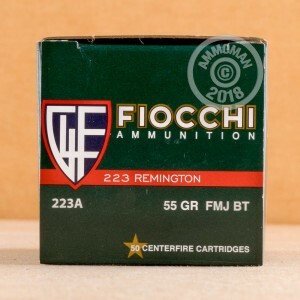 Conveniently packaged in 50-round boxes, this 1,000 round case of .223 Remington ammo from Fiocchi is a great choice to feed your AR-15 or other .223/5.56 rifle. It uses 55 grain full metal jacket bullets and Fiocchi's own non-corrosive Boxer primers and brass cases and enjoys a reputation for delivering relative cleanliness and superb accuracy at a fair price. 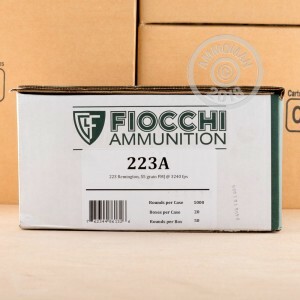 Fiocchi Shooting Dynamics ammo is one of the top brands for range use, so grab it while you can! 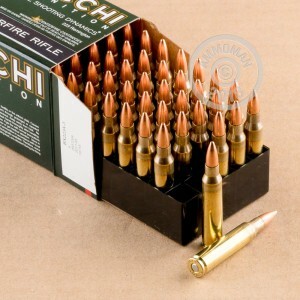 Fiocchi makes its centerfire rifle ammo for the US market in Ozark, Missouri, resulting in considerable cost savings that benefit shooters across America. Order this 1,000 round case containing 20 boxes now to take advantage of our bulk shipping offer--all orders over $99 come with free shipping, so you only pay the list price here. Great Service and lowest prices AmmoMan! No misfires, tight groups ... will buy again! Great ammo, great price. Can't beat 31 cents a round. Shoots good through the rife, but not the pistol. Shoots through the AR rifles just fine, however it doesn't have enough back pressure to eject the cartridge in our AR pistol, (13"). All in all its great for plinking in the rifles. Excellant product at a fantastice price. Super fast shipping. Yet to shoot these. have shot other Fiocchi products with great luck. Excellant product at afantastice price. This is the only ammo I shoot out with a AR-15. Some of the cleanest rounds Ive ever shot. Brass is reloadable if you do that sort of thing. I buy it at 1000 rounds everytime cause I shoot it so much. Ammoman has the fastest shipping and best price on everything they sell. Fair ammo at a fair price delivered with exceptional service. Great product and great company. Arrived in a timely fashion and is exactly what I needed. Will be buying all my ammo here. The ammo shot well and I had no problems feeding or ejecting. This ammo seems to be well made and packaged well too. I am pleased with the product. Great Ammo , shot about 450 rounds so far no problems at all !!! Very impressed. I would definitely recommend this to friends and family and will make another purchase. Delivery was very fast ordering was very easy. Great ammo and a great deal! All around good stuff! Order was received in less than two days, shoots clean and precise. Will definitely order again! Thanks Ammoman! I would recommend this ammo to use! Awesome! Great ammo worked every time! No miss fires! Got this for my new AR15. Haven't used it yet. Looking forward to using them. The ammo was very good Im using it for target practice. I will buy this ammo again and will try other ammo as well. Great value. Awesome target round. Very clean. Ammoman is great ordered some 223 on monday and it was at my door on Tuesday. Thanks! I use this Ammo almost exclusively when shooting my AR's. It's clean, fires everytime & made in Ozark, MO, one of my home towns over the years. I always recommend the Fiochi ammo to friends as well as Ammoman. The first time I ordered from Ammoman I was skeptical but they exceeded my expectations!! It's the only place I buy my ammo from now. Ordered 2000 rounds of this ammo and have not been disappointed. Very acccurate and functions flawlessly. A great buy and you can't go wrong buying from Ammoman! Can't beat this ammo! Price is right and it functions perfectly. My Tavor loves this stuff! Have fired over 300 rds without any kind of malfunction. Ammoman got it delivered quickly too! Gladd Ammoman is finally shipping to NY, I've always been happy with the price and quality. Great ammo at a great price. Perfect for plinking or hunting small game here in Texas. Keep up the good work Ammoman!